What authority does international law really have for the United States? When and to what extent should the United States participate in the international legal system? 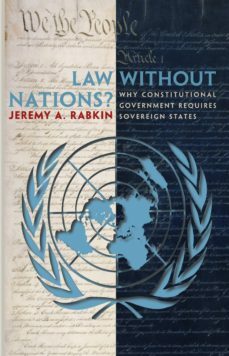 This forcefully argued book by legal scholar Jeremy Rabkin provides an insightful new look at this important and much-debated question. Americans have long asked whether the United States should join forces with institutions such as the International Criminal Court and sign on to agreements like the Kyoto Protocol. Rabkin argues that the value of international agreements in such circumstances must be weighed against the threat they pose to liberties protected by strong national authority and institutions. He maintains that the protection of these liberties could be fatally weakened if we go too far in ceding authority to international institutions that might not be zealous in protecting the rights Americans deem important. Similarly, any cessation of authority might leave Americans far less attached to the resulting hybrid legal system than they now are to laws they can regard as their own.Law without Nations? traces the traditional American wariness of international law to the basic principles of American thought and the broader traditions of liberal political thought on which the American Founders drew: only a sovereign state can make and enforce law in a reliable way, so only a sovereign state can reliably protect the rights of its citizens. It then contrasts the American experience with that of the European Union, showing the difficulties that can arise from efforts to merge national legal systems with supranational schemes. In practice, international human rights law generates a cloud of rhetoric that does little to secure human rights, and in fact, is at odds with American principles, Rabkin concludes. A challenging and important contribution to the current debates about the meaning of multilateralism and international law, Law without Nations? will appeal to a broad cross-section of scholars in both the legal and political science arenas.